If it passes Tuesday, competing interpretations of the Waterfront Protection Ordinance will likely be put to the test in court. If South Portland voters approve the controversial Waterfront Protection Ordinance on the city ballot Tuesday, the law will likely end up in court, lawyers and city officials say. But first, voters who aren’t accustomed to parsing legal arguments will weigh the claims of both sides, which have presented completely different interpretations of the same few paragraphs of law. Opponents of the proposed ordinance say it would kill waterfront business, prevent growth and scuttle jobs. Advocates say the ordinance would only prevent any future exports of Canadian tar sands oil through the city, and would not affect ongoing businesses. Before a judge, however, those arguments may not be as simple or clear as voters have been led to believe. The proposed law would change what is allowed in South Portland’s shipyard district, and within a 250-foot ribbon of land that hugs portions of the city’s commercial zones. The city’s zoning now allows petroleum handling operations, including tank farms and other petroleum-related businesses, in those areas. 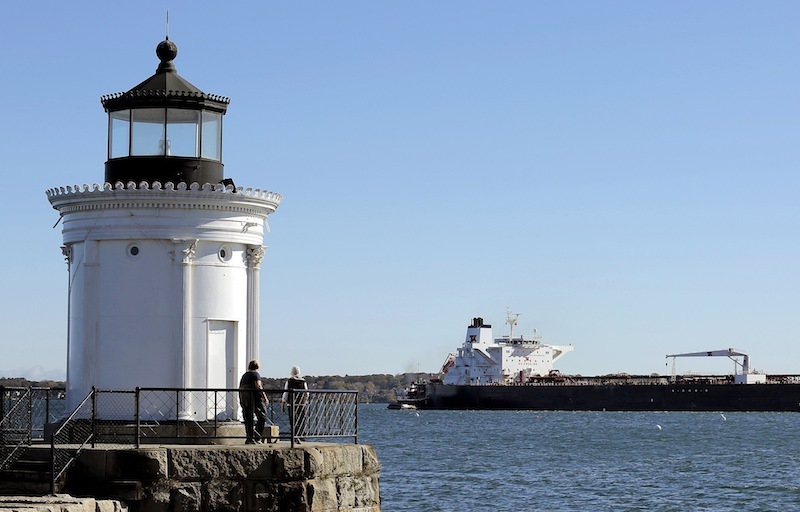 The Waterfront Protection Ordinance would add language to the definition of an allowed petroleum use, to more strictly define it as only the off-loading of petroleum from ships docked in South Portland. The intent, the authors say, is to prevent the export of tar sands oil through the city while preserving the offloading of petroleum the way it has been done on South Portland’s waterfront since the 1940s. The Waterfront Protection Ordinance is intended to employ the city’s land use authority to prevent Portland Pipe Line Corp. from using one of its underground pipes to bring Canadian tar sands oil to terminals in South Portland for shipment to faraway refineries. The oil is a thick form of raw petroleum, mixed with sand and water, that lies in vast reserves under Alberta. Until recent price spikes in the global market, tapping those reserves was considered too costly. The oil poses unique challenges. At room temperature, it has the consistency of cold molasses, so it must be diluted with chemicals to make it flow easily through a pipeline. The chemicals, some of which would be burned off in the handling process, contain benzene, a known carcinogen, supporters of the ordinance say. Referendum supporters have called the threat of tar sands oil imminent if the ordinance is not passed, and framed the vote as a public health issue. They say that a spill from the pipeline could endanger Casco Bay and the Sebago Lake watershed, which provides drinking water for much of Greater Portland. Even without a spill, they say, gases emitted in the handling of tar sands oil are harmful and could cause respiratory ailments. Many also cite the risk of accelerated climate change if the Canadian oil is developed and exported. Businesses connected to the petroleum industry have spent more than $600,000 so far to defeat the proposed ordinance. They argue that there is no plan to bring tar sands oil through the city, and that the ordinance language is so broad it would devastate existing businesses that have nothing to do with the controversial crude. Referendum opponents have commissioned telephone polls, sent glossy mailers to residents, hired costly marketing professionals and paid for an economist to write a study envisioning a waterfront without businesses. Much of the doubt raised by the law’s opponents has centered on a provision that would prohibit expansion or enlargement of existing petroleum-handling facilities, defined as construction, reconstruction or alteration of a facility that would change its function or capacity. The law also would prohibit construction of new combustion units, stacks, vapor recovery systems, equipment, structure, or machinery for transportation or storage of petroleum, including any pumping, distribution or other facility for loading tankers. The definitions are prefaced by a phrase – “notwithstanding any other provisions of this code” – that has drawn intense scrutiny. Attorneys for the opponents say the provisions would prohibit practically any waterfront business that handles petroleum products – even if that handling is secondary to another use, such as a marina or boat yard – from expanding its operation or maintaining equipment and buildings. Matt Manahan, attorney for Portland Pipe Line Corp., has contended since the law’s introduction that the language would prohibit any facility that stores and handles petroleum unless that petroleum were offloaded from a ship. Boat-fueling at marinas would become a non-conforming use, he argued in a letter to the City Council dated Oct. 21. The phrase “notwithstanding any other provisions of this code” means the restrictions cannot be overridden by other aspects of South Portland’s zoning – even when the other provisions expressly allow marinas to handle petroleum to fuel boats, he argued. “It is a fundamental rule of statutory construction that the courts will first look at the plain language of the ordinance when interpreting its meaning,” Manahan wrote. Proponents of the ordinance – including Natalie West, who wrote the proposal – have said Manahan’s analysis is out of context with the zoning ordinance as a whole, taking singular phrases and construing them in ways that courts will not find logical. “The question is not ‘What does this phrase mean?’ but ‘How do we interpret this ordinance to carry out its purpose, taking into account the interests involved and giving meaning to the terms that are set forth in the ordinance?’ ” she said. West pointed to the multiple, explanatory notes attached to the ordinance petition, known as findings. Point by point, they spell out the need for the law, the purpose for its introduction and how it would benefit citizens. Among other items, the findings discuss a citywide desire over the long term to shift the shipyard district from industrial uses to more mixed uses; an affirmation of the aquatic life around the shoreland area; the city’s environmentally conscious attitude toward climate change; and a desire for the shipyard district’s light industrial uses not to conflict with nearby residential zones. When West included the phrase “notwithstanding any other provisions of this code,” she said she was referring to a brief provision in the expansive zoning law that gives special permission for expansion of an oil tank facility at Broadway and Preble Street. She said the phrase is typically used to refer to any other portions of the code dealing with the same subject matter, not to every other provision in the entire code. She said the language prohibiting enlargement and expansion applies only to construction or equipment changes that support new uses of existing petroleum facilities. That would include equipment to change a pipeline’s direction, which requires pumping stations, vapor stacks or other machinery with a use other than the ones historically accepted there. West said that if the ordinance passes, the City Council and city staff should consider the vote as carrying a clear message: Residents want to be protected from tar sands oil and existing businesses want to continue to thrive, and that should guide the city’s interpretation of the law.